What is the Step Ahead 4-Week Active Weight Loss Membership? 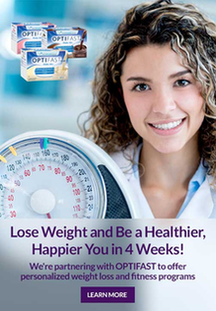 Step Ahead Wellness Center’s 4-week active weight loss membership offers quick weight loss combining lifestyle education and medical monitoring with a low calorie diet using OPTIFAST meal replacement products. This membership will help you jump-start your weight loss goals with the intense, supportive coaching of a physician and registered dietitian. How does the meal replacement diet work? Weight loss with meal replacements is achieved by the restriction of carbohydrate and total energy intake. This enables your body to use its fat stores as energy. OPTIFAST products contain carbohydrates, fatty acids and protein, which helps preserve lean body mass while you lose your fat stores. They also contain vitamins and minerals to ensure that you are receiving all the nutrients you require for safe and healthy calorie restricted diet. Optifastis available in a wide range of products such as soups, shakes, bars and desserts, in several delicious flavors. At any point during your program, we will complement OPTIFAST products with low calorie meal and snack options using whole foods. Although individual results vary, the typical patient loses 3-5 pounds per week. Can I eat food while on the program? During the 4-week Active Weight Loss Phase, you will consume a full meal replacement diet of OPTIFAST products. You will also have the option to include 2 cups of low starch (green) vegetables & 64 ounces of water or low calorie fluids each day. You can also have sugar free lollies and diet jelly if you are craving something sweet. One teaspoon of vegetable oil (olive oil or canola oil are fine) per day is recommended with your vegetables to decrease the risk of developing gall stones. A complete list of Step Ahead “free foods” is provided at your initial consultation. The total calorie intake of this phase is 800-1,000 calories per day. Once you have completed the 4-week Active Weight Loss phase, you then progress onto the Accelerated Transition Phase, which gradually reintroduces whole foods. Clinical studies suggest medically monitored weight management programs are safe, effective and help individuals to address and modify behaviors to encourage long-term weight management. As a Step Ahead member, you receive the luxury of both one-on-one monitoring in the office as well as virtual support via email from our team of experts. How much does the 4-week membership cost? Patients receive a free in-person or phone welcome consultation to get detailed information on the cost of the 4-week membership. Patients are welcome to meet our team of health experts and learn about our additional membership offers. AtStepWellnessCenter, we understand that weight loss is a journey, not a race to the finish line. At the completion of your 4-week membership, we offer an Accelerated Transition membership, which includes an individualized diet and exercise program that reintroduces whole foods with the option of meal replacements to help you stay within your calorie goal. You will continue to receive ongoing lifestyle education and support by our team of experts. We’ll be with you every step of the way helping you achieve real change, picking you up when you stumble and celebrating your successes. Are any Step Ahead memberships covered by insurance? StepAheadWellnessCenterdoes not directly participate with insurance carriers. However, you can request reimbursement through out of network benefits. It’s important to contact insurance providers, prior to the program, to see if they cover a portion of it. Employee benefits and health care spending accounts are also options for reimbursement with some employers. We will help you in any way we can to facilitate insurance reimbursement. Kick Off Your Weight Loss with a Quick 4-Week Weight Loss Membership ! Narrowing your food choices helps you work towards weight loss and management by controlling the amount and types of food you eat. Utilizes the expertise of a physician to help you lose weight safely. Individualized counseling by a registered dietitian and certified personal trainer who understand your challenges. A program designed to help you achieve and sustain better health through nutrition, exercise and lifestyle changes. Included both during and after weight loss to help you achieve and maintain success.